Soo, you think we can all get in on this whole Pizza Thursday thing?? I know it doesn’t quite have the ring of Taco Tuesday, but let’s be real, anything with the word pizza in it sounds pretty dang GOOD. Ok, ok and pizza has a way of curing all. Meaning stress, headaches and all the “oh man, I wish it was Friday” thoughts that are flowing through your head right now. 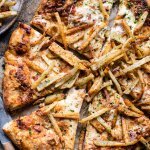 It’s true, pizza is a magical food full of carbs and cheese…aka two of my most favorite ingredients! Serious Question: have you guys ever felt so mentally and physically exhausted that the only thing you could possibly do was lay your head down?? Cause that was me this last Tuesday. I got home from Chicago late Monday night, ate, showered, hit the pillow running and was out within seconds. I got up the next morning, did my morning thing and then I dunno, something hit me and basically I couldn’t even function. Like I had to put my head down cause, if I am being honest, it felt like it weighed a million pounds and everything on my body was completely sore. For a while, I was worried I was getting the flu or something, but after a quick cat nap (literally…cause little Snape snuggled in next to me) I pretty much felt a million times better. For some reason I was still sore, but at least I felt energized. Once I was up and moving again, I had only one thing in mind that I HAD to do. Also, I am kind of super sad to report that during my short stay in Chicago, I never had even one slice of pizza. I know, I know, what?!? Saturday night mom and I went to some lame place (bad choice on our part…we really should have planned better…and made reservations) and tried to order a deep dish spinach margherita pizza, but um they said it would take at least and hour. We were starving, like starving, so that was not happening. Complete bummer, but there is always next time right?! Oh, and since we are on the topic of my last trip, I feel like I should mention the super weird car ride down to the airport with my dad’s cousin Ethel who is currently planning on setting me up with a guy. Dear God help me. That was a long two-hour ride…. 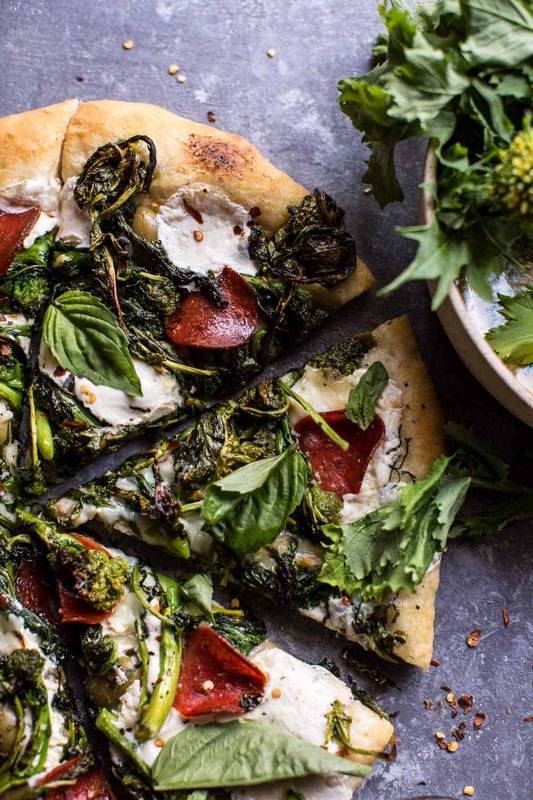 Anyways, let’s get back to talking about this supper yummy Broccoli Rabe Burrata Pizza! 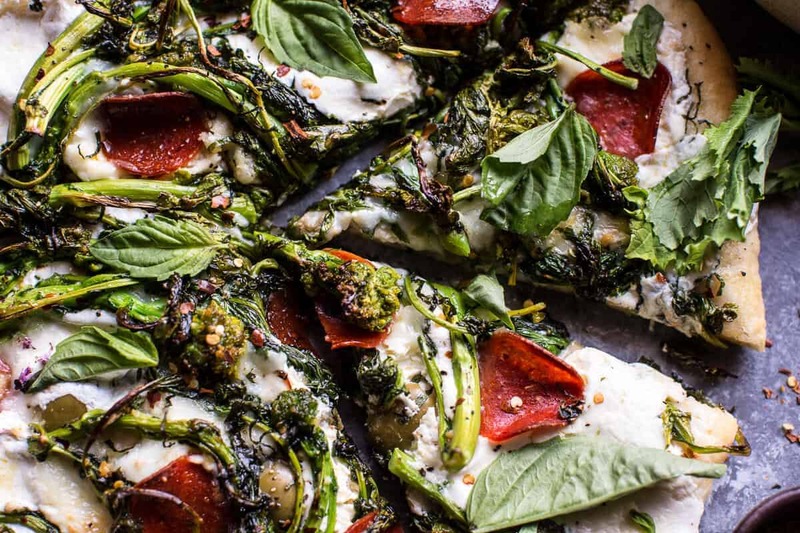 The pizza is topped with sautéed broccoli rabe, pepperoni, mozzarella AND burrata cheese, fresh basil, lots of garlic and a couple good pinches of crushed red pepper flakes…ah is there anything better?!? Thinking not at this very moment anyway. Hello… all that cheese!! And hey, there are totally tons of greens, so yup that means this is a completely well-balanced meal. Hehe, don’t you just love the way I think? 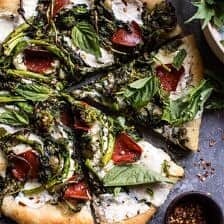 OH, and this is a GREEN pizza, making it perfect not only for St.Patrick’s Day, which is in just one week, but also for the start of spring!! YEAHHH!! If you can’t find broccoli rabe in your grocery store, I recommend using broccolini in its place. You could throw on a couple of kale leaves as well. As for all you vegetarian eaters out there, as much as I love the pepperoni, you can simply omit them. Not a huge deal! For the dough, I used my favorite homemade pizza dough, which I have been keeping on hand for weekly Pizza Thursday nights. You can also use store-bought dough if you’d prefer, but I can’t lie homemade is always the way to go! Either way, I’m pretty sure you will quickly become addicted to this simple pizza pie…obviously. Heat a large skillet with high sides over medium-high heat and add the olive oil. 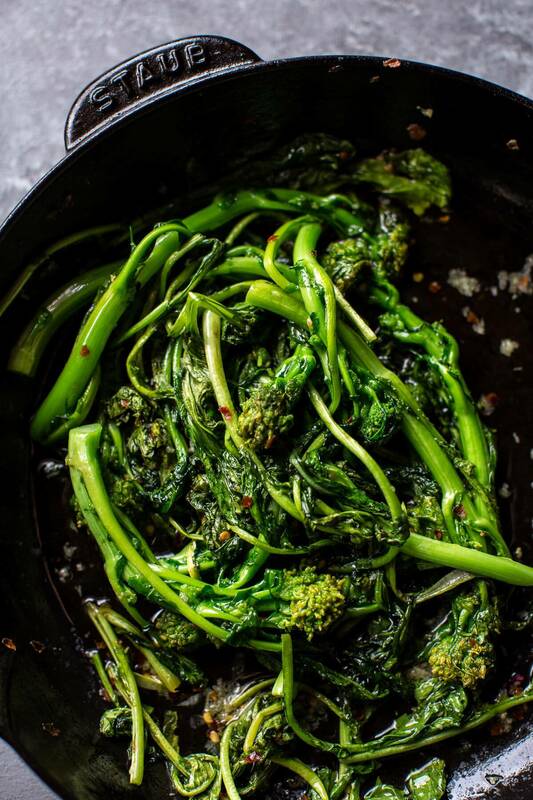 Add the broccoli rabe and season with salt + pepper. Cook until the broccoli rabe has wilted, about 3-4 minutes. Add the crushed red pepper flakes and garlic and cook another 30 seconds to 1 minute. Remove from the heat. Once the pizza dough is ready, lightly flour a counter. Use your hands or a rolling pin to roll the dough out until you have a flattened disk. Place the pizza on a greased baking sheet and then use your hands to gently tug, pull and push the pizza dough into your desired shape. You can make 1 larger pizza or 2 smaller pizzas with this dough. I typically go with 2 smaller, thin crust pizzas. Using a spoon, spoon some of the oil from the pan over the pizza dough, this oil will act as your "sauce". Now add the olives, broccoli rabe and sprinkle with half of the basil. Add most of the mozzarella cheese and all of the pepperoni. Bake the pizza for 8-10 minutes or until the cheese is all melty and gooey. Remove from the oven, add the burrata and place back in the oven for another 5-8 minutes. 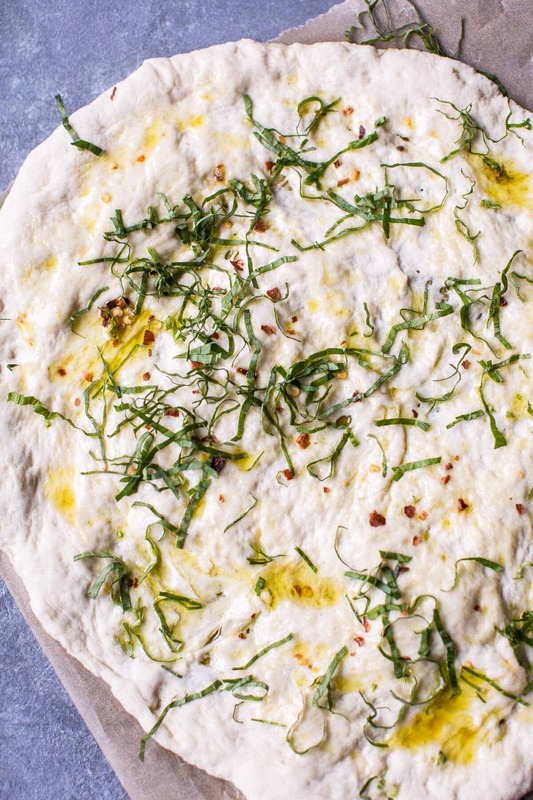 Sprinkle the pizza with fresh basil, salt + pepper. 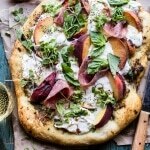 *If you are feeling extra fancy, adding goat brie to this pizza is pretty epic! Gimme all the cheese and carbs please! Yay-yah!!!!!! This pizza is so made for me! I’m glad you had a safe trip Tieghan, but it is a bummer you didn’t get your deep dish, maybe next time. p.s. I’ve totally had non-functional days like you said where you just have zero energy. Try to get some more sleep, Girl so you can keep up with your own awesomeness! 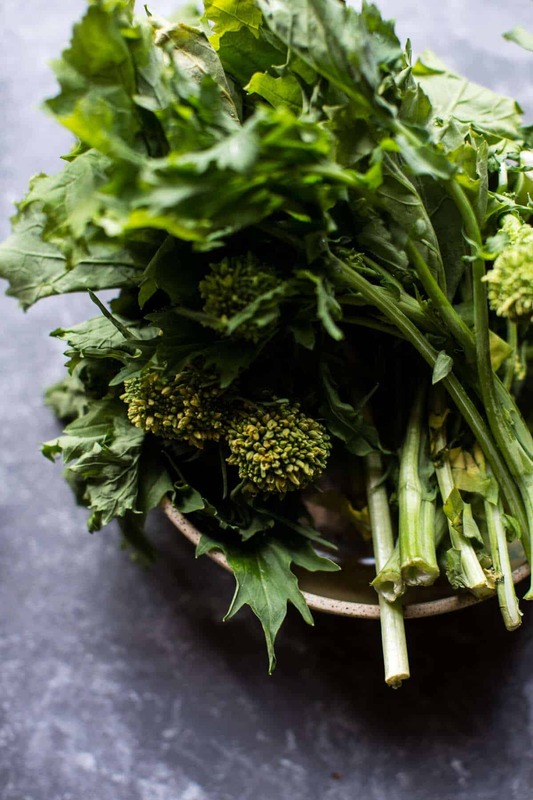 This looks interesting – I’ve had sprouting broccoli on my pizza and it was delicious. I’m still yet to try burrata, I keep meaning to, this looks like a good way to try it. Yessss! 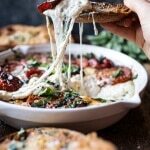 I love that you put burratta and on everything, we’re SO into that. 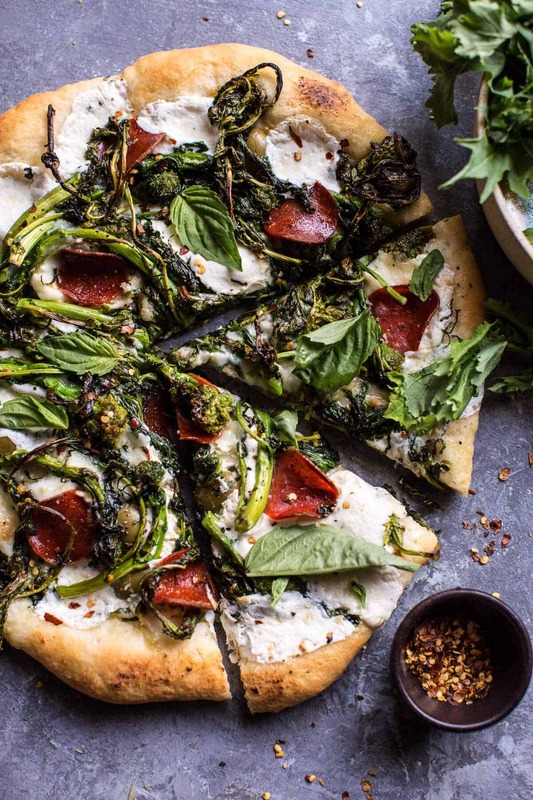 This sounds like a delicious pizza, especially with all the greens going on! Oh boy, oh boy, I loooove rabe!!! And burrata! And pizza!! Stands to reason I must cook this one soon. Thanks so much, Miranda! Hope you are having a great week! Oh, Tieghan..this pizza looks so good!! And since I started eating broccoli just recently, now it’s easy to get me excited 🙂 Your pictures are great as usual! I was wondering, what kind of lense do you use?? This must be pure heaven! For me the only problem is finding burrata here in Portugal, because it is quite hard. 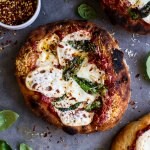 But your pizza… OMG… as everything you cook… must be heaven! Thank you so much! Hope you are having a great week! Burrata seriously makes everything better. And don’t worry about missing out on deep dish… as a Chicagoan myself, it’s really not all it’s cracked up to be! Burrata truly is the best! 🙂 THANK YOU! 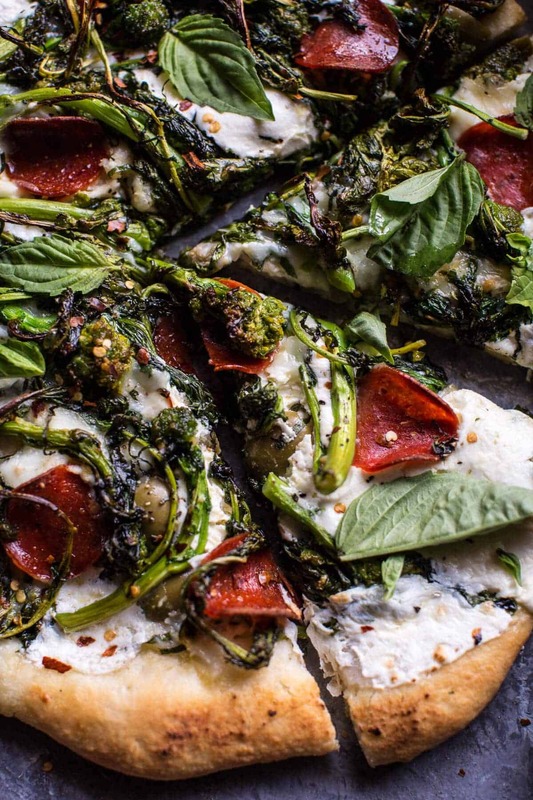 Don’t worry about someone else’s pizza when you make a darn good one. But I hope you make it back to Chicago soon. Also I have two friends one married over 20 years and the other married over 40 years and they were fixed up on their first date by friends. Pizza Thursday’s a thing?! MAN I have to make use of it! This looks to die for. Good thing you’re back in Chicago! Making this tonight!!! LOVE LOVE LOVE!! Looks great! . In the interest of honesty, I don’t think I have ever found a pizza that I didn’t like. LOL! Pizza truly is the best! This is simply fantastic. I love broccoli rabe and this combo is so so yum. This definitely makes up the deep dish pizza. This pizza is so rustic and beautiful. Great job on the food styling and photography! This is so pizza perfection! And the burrata… the best! if i can’t find burrata can i use white cheese over it and broccoli over broccolini?by the way it looks so great i love your blog. HI! Any cheese that you love will be great! Mozzarella or other white cheese. Let me know if you have questions. Thanks!! to read them and have now very much been loving these things. this form of high-quality themes most people are really desirous to know about. My personal sincere apologies for not expressing gratitude to sooner. I am not very excellent with English but I come up this real leisurely to understand.